Virtually everything in this set is extremely rare, seriously upgraded, or totally unseen/unheard material. Simply put - HMC believe this is the most incredible Beatles title ..... EVER ! Without Going Out Of Your Door ... 10th January 1968 - George with the Indian musicians being filmed working on "Fantasy Sequins"
You Know How Hard It Can Be ... 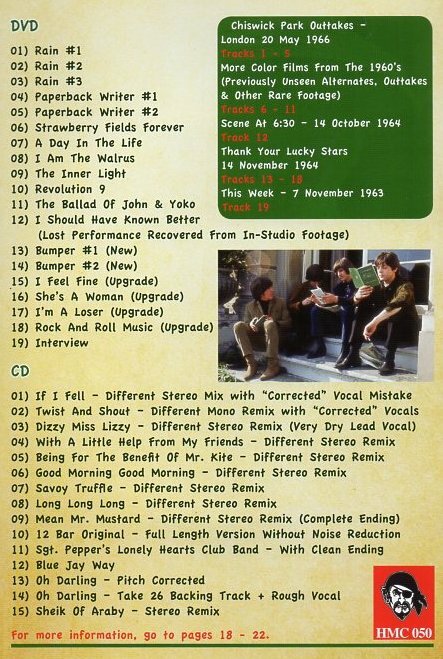 Article of John and Yoko's wedding and "Ballad of John and Yoko"
And then it includes full track-by-track details of the DVD and the C.D. an essential guide can be found at Doug Sulpy's "The 910" - Summer 2018 Edition. First a minute from Slate 11 - three performing Beatles with Ringo sitting on a plinth. The next segment, almost a minute long is from Slate 1 - Performance in the garden. 2 Rain #2 More intercut non-performance material - 13 shots ! 3 Rain #3 None of this version has been seen before. A single unedited take shot from the right side of a complete performance. 5 Paperback Writer #2 Starts with the garden performance again, but the different camera angle. Then as above, cuts between the two angles of the two performances. Colour Films From The 60's - Unseen, Outtakes & Rare ! Although, there is no recorded evidence of it's creation. Whether original or not, it contains much previously unseen footage. in fact, it is comprised of mostly previously unseen footage. It even includes outtakes not seen on the two recent Ultimate Mystery Trip releases. 9 The Inner Light A first-ever presentation of this song on video, but not a lost video of the song. 10 Revolution 9 A first-ever presentation of this song on video. 13 I Should Have Known Better Lost performance recovered from in-studio footage. 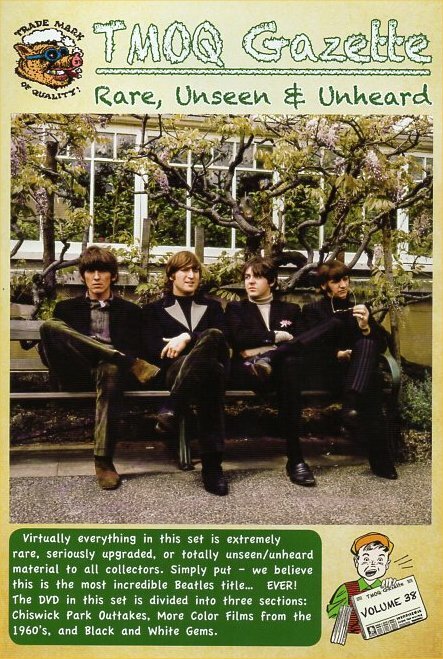 Filmed at Teddington Studios where the programme was renamed "Lucky Star's Special" in the Beatles honour. Also it includes the Beatles featured earlier in the show never seen before in their entirety. 20 Interview 5th November 1963 - "This Week"
An Associated-Rediffusion television crew filmed The Beatles in the back of a car driving around London for a documentary called "The Beatles and Beatlemania", to be included in their current affairs programme This Week. This is the complete Beatles interviews from the back of the limo in the best quality. The first 7:20 is Ringo and George in the back of the limo, the final 3 minutes and 20 seconds is John and Paul. Only a small portion of this was actually broadcast. Doesn't sound like an "upgrade" - it's scratchy like from an acetate and has no digital processing. Two songs from original acetates, scratchy, no declicking or other processing. Technically forgeries - remixes not officially created - presented here as bonus tracks.